Mansfield, Ohio - The Humane Society estimates there are 50 million feral cats in the United States. While an exact number is not known for Richland County, there are enough to cause a problem. "Mansfield has reached the tipping point where they need an animal control officer," said Diana Nolen, president of Stop the Overpopulation of Pets. "Ohio has only dog wardens." Feral cats are distinguished by their lack of familiarity with people. For all intents and purposes, they are wild. 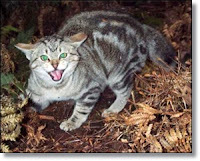 In 2001, Alley Cat Allies launched the first National Feral Cat Day to promote raising awareness about feral cat colonies and how to care for and prevent them. Sunday is the 15th such day. Nolen and her organization at 1152 Lexington Ave. do their part, offering low-cost spaying and neutering. The cost is $31 for males and $49 for females. "That's about the cheapest price in 50 miles," Nolen said. She estimates they have spayed or neutered 34,000 cats in the last 17 years. Of the 93 cats currently housed at S.T.O.P., nine are feral. "They're hard to handle without getting hurt," Nolen said. S.T.O.P. has rebounded since a fire in January 2014 forced them to move to a temporary location downtown. Another organization that tries to help is Forgotten Felines of Richland County, a nonprofit started by Anne Wendling and Carla Waleri. Since Wendling passed away in January, Waleri has continued feeding some feral cats in the downtown area. She has trapped some cats for spay/neuter and health care, but the number has been minimal because she is operating largely by herself. "Before I met Anne Wendling, I just had no idea how many feral cats there were," Waleri said. One of the goals of Forgotten Felines is to relocate some of the downtown feral cats, after they have been spayed or neutered, to barns. People would be responsible for providing food, water and shelter, as well as long-term veterinary care, for the relocated cats. Flyers have been posted around town, but there has been little response so far. For more information, call Forgotten Felines at 419-756-6625. Trap-Neuter-Release is the most popular suggestion for controlling the population of feral cats. It has caught on in many places, but it does require a commitment from people to look after the cats after they have been spayed or neutered. "People who feed strays but don't neuter them are contributing to the problem," Nolen said. "If you're going to feed them, you need to fix them." Feral cats can be worth the effort. Nolen recalled a cat named Ruby, who was found trapped behind a fast-food restaurant. "All you did was walk in the room, she would attack the door (of her cage). She would hiss and spit," Nolen said. "You can now pet and hold her. That's a true miracle."